Tapirus bairdii, or Baird's tapir, is one of the four living species of tapirs. 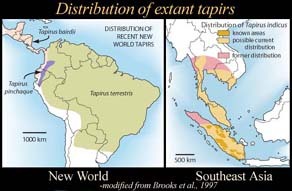 The range of Baird's tapir extends from southern Mexico through Central America to the northwest of South America, although information on the southernmost occurrence of this species is scanty. The range is actually much more fragmented than shown on the map on the left, Baird's tapir being absent from many areas of is former range (such as El Salvador, and apparently Ecuador), and extremely rare in other places, such as Colombia. Baird's tapir is listed as "Endangered" by both CITES - Appendix I, and the IUCN 2002 Red List. All tapirs have a fleshy prehensile proboscis (a small muscular trunk), as seen in the thumbnail on the right. The trunk is made up of muscles of the face and upper lip. The intricate arrangement of these trunk muscles allow for a great deal of complex movement. Tapirs use their trunks when foraging - grasping vegetation, and moving items into their mouths. 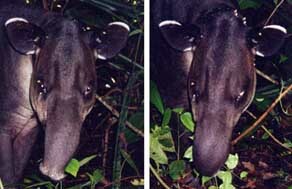 For more pictures of the tapir shown on the left, go to 'More Tapir Photos'. 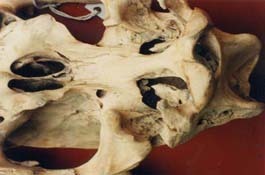 The presence of a muscular trunk is reflected in the architecture of the skull. All tapirs have a deeply retracted narial incision (nasoincisive incisure), tubercles and scars for the attachment of trunk musculature, and lack much of the bony wall of the nasal chamber (see Tapirus terrestris). 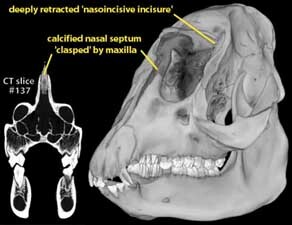 The architecture of the skull of Baird's tapir is even more unusual in that it has the most extreme retraction of the narial incision among tapirs, and it also has a strongly ossified nasal septum that is clasped broadly by the upper edge of the maxilla. Skull architecture reflects presence of trunk. This specimen of Tapirus bairdii (AMNH 80076) was collected in Honduras, near Tela, in May 1926 by Goodhue Livingstone, Jr.. It was made available to The University of Texas High-Resolution X-ray CT Facility for scanning courtesy of Dr. Nancy Simmons of the Department of Mammalogy at the American Museum of Natural History. Funding for scanning was provided by Dr. Timothy Rowe of The University of Texas at Austin. Baird's tapir is one of several tapiroid perissodactyls included in ongoing research by Dr. Colbert. 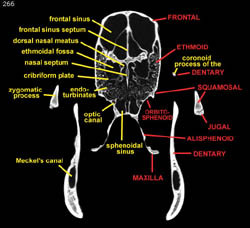 Unusual nasal development of AMNH 80076. 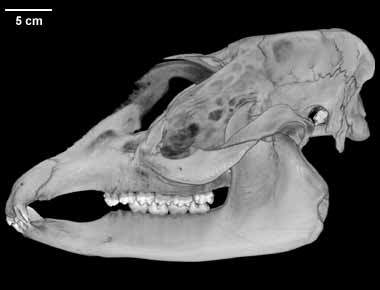 Baird's tapirs are known for the great morphological variability of their nasals (see Hatcher, 1896). 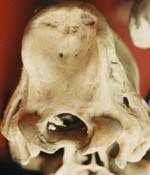 This can be seen in AMNH 80076, which shows the unusual condition of a reduced right nasal, an extra ossification of the left nasal, and frontals (especially on the right side) which intrude between the two nasals to keep them from contacting one another. It is possible that the variability seen in T. bairdii nasal morphology is related to their extremely retracted nasoincisive incisure. 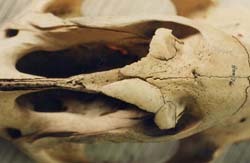 The well fused sutures in the basicranial region of the skull indicate that this was a relatively mature individual. The specimen was scanned along the coronal axis for a total of 395 slices, each slice 1.0 mm thick with a 1.0 mm interslice spacing. The scanning was done by Richard Ketcham, Cambria Denison and Matthew Colbert on 03 March 1998. The animations of Baird's tapir are reduced from the original data for optimal Web delivery. See the inspeCTor for unreduced CT data. Click on the thumbnail below to see the detail discernible in an unreduced sample slice through the braincase. Click on image to see an unreduced, labeled slice. Brooks, D. M., R. E. Bodmer, and S. Matola (compilers). 1997. Tapirs - Status Survey and Conservation Action Plan. (English, Spanish, Portuguese.) IUCN/SSC Tapir Specialist Group. IUCN, Gland, Switzerland and Cambridge, UK. viii + 164 pp. For more pictures of Baird's tapirs, check out 'More Tapir Photos'. Put additional imagery tab content into the 'scantab' code block in index.phtml. To cite this page: Dr. Matthew Colbert, 2002, "Tapirus bairdii"	(On-line), Digital Morphology. Accessed April 24, 2019 at http://digimorph.org/specimens/Tapirus_bairdii/	.